Orginally released in September 1980 and reached number 21 on the U.K. chart. Re-released in July 1982 and reached number 1 on the U.K. album chart. Originally released in 1980 the album had moderate success. 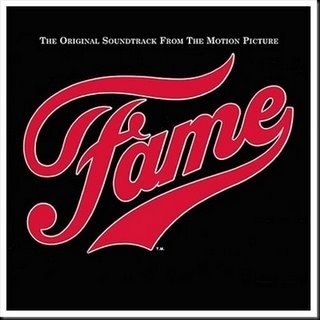 However with the instant success of the TV show in the U.K. the Fame theme became a huge number 1 hit for Irene Cara and this prompted the original movie soundtrack to go to the top of the charts too. I remember when I first saw the Fame album I thought it was the album from the TV show that was being advertised but looking at the cover didn't recognise any of the songs. The cover didn't help either as it was plain black with the red fame logo on it. I always thought it a little bizarre that they used that red logo because although it was the logo for the TV show it was never used in the actual film. I didn't buy the album at first but after awhile I hired it from the library and recorded it. Very naughty I know but I was poor. I did eventually buy a copy when I saw it cheap in a sale as I wanted it for my collection. I needed anything and everything to do with Fame! Even though I didn't buy the album at first I did buy the single. At the time I played that single to death and drove anyone in the household mad with it. It was so infectious and so uplifting. 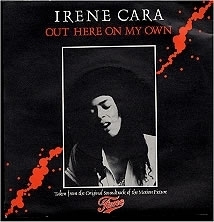 Out Here On My Own - written by Michael Gore & Lesley Gore performed by Irene Cara. This was also released as a single a single in the U.K. but sold rather disappointingly. Personally I loved this as it's a great ballad and really shows off Irene's voice. Apart from the actual theme song it's become the song that people most associate with the show and movie. This was the B-side to the U.K 12 inch single and to be honest always seemed a little silly to me. I like the songs but it's the lyrics that get me. I guess it suits the scene in the cafeteria though. I always loved this song. I guess there is a bit of a rebel in me (although I was never brave enough or had enough confidence to rebel but the idea appealed to me). This song took a while to grow on me and felt very old fashioned to me. However over time I've come to really like it. Surprisingly the soundtrack doesn't really have that many up-tempo tracks so it starts to stand out after awhile. This is another great ballad by Paul. He certainly has a way of portraying the emotion and loneliness. This was the B-side to out here on my own. Performed by Contemporary Gospel chorus of the High School of music and art. This was the B-side to the Fame Single and is totally different in style but still I like how it builds and utilizes the choir. This is a pleasant instrumental piece of background music but it always felt a little like filler to me. I Sing The Body Electric - written by Michael Gore & Dean Pitchford performed by Irene Cara, Paul McCrane, Laura Dean Traci Parnell & Eric Brockington. I always loved this epic song which was used as the fantastic film finale. Mixing the differing styles of music of classical, rock and the choir works so well. Although at the time I had no idea what the body electric meant. I don't really remember this from the film but always loved it from the pilot episode of the TV series where it was sung by Kenny Rankin. Fame instrumental & Out Here On My Own instrumental. Both are great instrumental versions of the original songs.